Damn, they are not spreading anything out too long this season, are they? 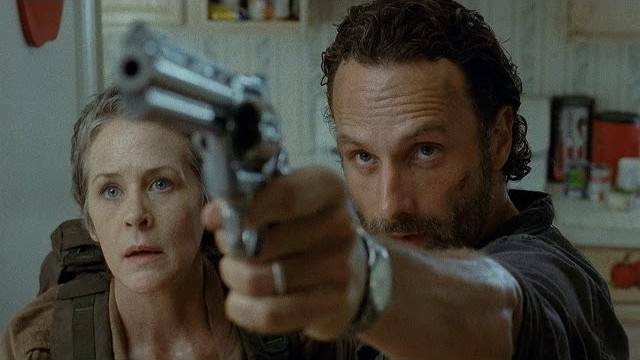 This episode springboards from Carol’s (Melissa McBride) admittance of guilt for the killing of Karen and David, sending her on a supply run with Rick (Andrew Lincoln) to give the former lawman time to think over how he wants to handle the situation. 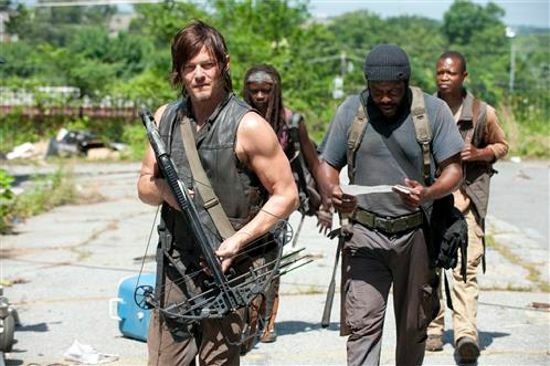 At the same time, we also continue to follow Daryl (Norman Reedus), Michonne (Danai Gurira), Tyreese (Chad L. Coleman), and Bob (Lawrence Gilliard Jr.) as they try to reach the veterinary school to get drugs for the sick folks back home. As many people have pointed out, there’s a pretty blatant theme of “letting go” reiterated over and over in this episode. But what most people aren’t talking about is the muddied way the concept is presented and how that causes an odd cognitive dissonance with the way events play out in the end. It is made pretty clear that Bob’s inability to let go of his guilt and his addiction (physically represented rather simplistically in his hanging on to the backpack full of booze) is a negative. He sacrifices the good of the group for his own needs, nearly costing his own life in the process, but also nearly hampering the supply group in a way that could get someone killed. 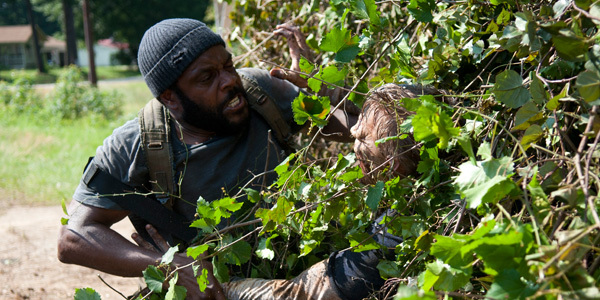 Tyreese’s inability to let go of his anger is also overly-simplified in the physical act of not letting go of a walker that could kill him. In both cases, the scripting by writer Matthew Negrete could be more subtle, but at least, again, we’re using action rather than words to get major points across. So there’s some good with the bad. But the main point to consider here is that the characters need to let go of the past and the crippling emotional concerns that tie them to what they’ve lost in order to survive in the zombie apocalypse. They have to keep looking forward, and as we saw last week with Beth (Emily Kinney) and Maggie (Lauren Cohan), that can be painful and force you to detach emotionally as much as you can without losing your humanity. Hell, Michonne is even letting go of some of her anger toward the Governor this week. And that’s where the Indifference of this week’s title comes into play. Over in the other storyline this week, Carol demonstrates the ability to let go a little too casually for Rick’s comfort, putting the thematic resonance of the final act of their story into direct conflict with that of the others. 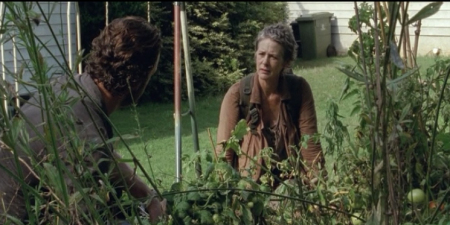 In this case Rick is the one who can’t let go, but if Internet chatter is anything to take into consideration, most viewers agree that he did the right thing in cutting Carol loose from the group. Granted, he is in a bad spot. He can’t really take her back to the prison without keeping her secret, and he’s not one to keep secrets. But he feels he has to do something, despite having removed himself from all decision making for the group since taking in the Woodbury survivors. And as with all of Rick’s decisions, he frames it as a choice that is good for the whole, but it is really about keeping his own kids safe. 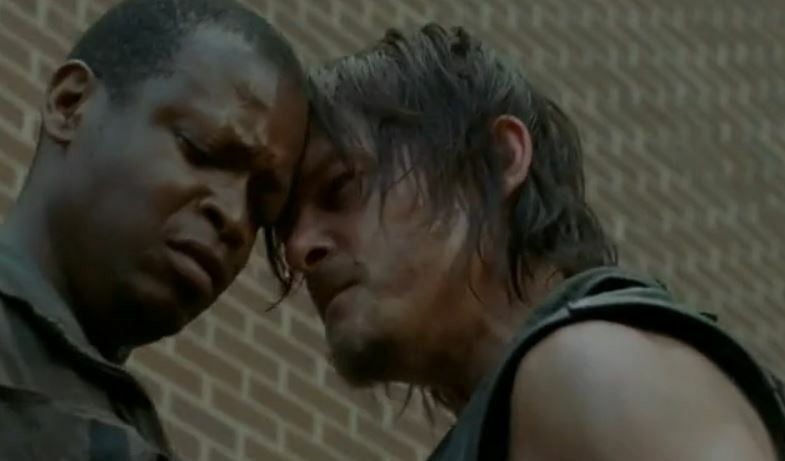 We’ll have to see this week if Daryl agrees with his choice. Rick takes it upon himself to decide that Carol’s detachment from new members (or potential members) of the group coupled with her letting go of her pre-apocalypse life — up to and including the isolation of feelings of grief over Sophia — is too much, making her dangerous. Can’t have a woman making those independent decisions that you used to make, eh Rick? I say that jokingly, but really, the way the scene played out, that’s how it felt. 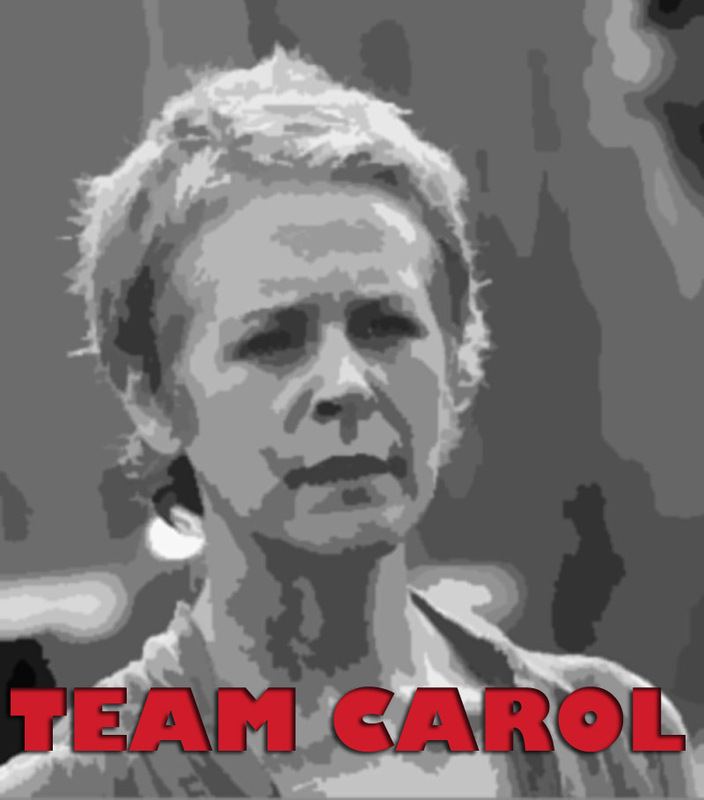 Rick remained hesitant and weak while Carol was decisive and made decisions on the fly. She also demonstrated a practical sort of strength by performing what was essentially field medicine, repairing Sam’s (Robin Taylor) dislocated shoulder and then emotional strength when discussing how she’s changed since her abusive husband died. When she sends Sam and Ana (Brina Palencia) to hunt for more supplies instead of allowing them to stay safely waiting for Carol and Rick to do it, it was another decisive moment. Rick chose to baby them, protecting them from possible harm, while Carol chose to essentially test their skills by giving them a task and seeing what happens. Thematically, this is one of the most powerful moments this season, comparable to the abandoning of the hitchhiker in last season’s “Clear” — which was Rick’s choice, if you remember. It was a hard choice then, and it’s a hard choice now. The world hasn’t changed; Rick has. He couldn’t handle the constant loss, went mad for a spell, and now has pulled back from taking responsibility for others. Until it suits him, that is. Now he suddenly decides that these people with little to no survival skills need his protection and when Carol treats them the way he treated the hitchhiker, she has suddenly crossed a line and should be banished. The characterization of Sam and Ana ties into other themes in play this week as well. They’re sentimental and soft, trapped in a bathroom by a single walker and lacking any fundamental skills for survival. Ana is even physically hampered with a twisted leg that when broken didn’t heal right. Sam’s dislocated arm serves to also symbolically make it plain that these two aren’t long for this world without help. 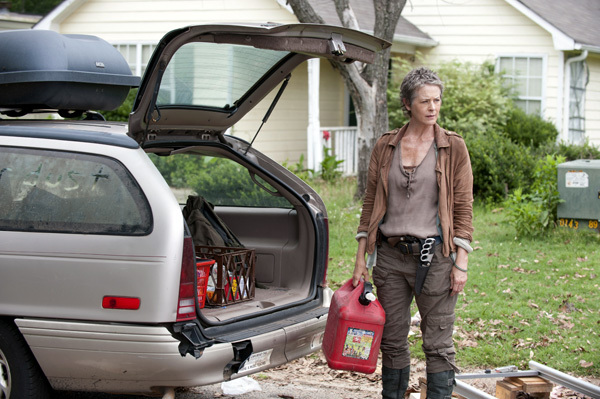 The old Rick would have agreed with Carol’s decision to use them to cover more ground and possibly find more supplies. New Rick wants to keep them sheltered, pitying them rather than respecting them. In this world, respect means accepting the possibility of death is around every corner and taking responsibility for your own actions. Pitying them would accomplish nothing but ensuring another pair of mouths to feed that had no ability to contribute anything in return. They weren’t children. They were adults. And when they don’t come back and Carol is detached enough emotionally to pack up and move on, suddenly she’s a threat to Rick’s children because she might be strong enough to take care of business when the time comes. If it ever comes. We can bicker back and forth for days about whether murdering Karen and David was morally acceptable or not, and in the real world there would be no confusion. Carol opted to kill them before the council made a decision about what to do about the sick. Wrong choice, clearly. But this is the zombie apocalypse, and Carol had just watched a kid go to bed with a cough only to wake up and trigger the deaths of fifteen or sixteen more people. The flu is clearly contagious, and Carol made a gut decision to try and nip it in the bud. The same sort of decision Shane would have made in Season Two and Rick would have made in Season Three. If it had worked, it would have been the right decision, no question. But it didn’t. And because it didn’t, the creative team of The Walking Dead has given us a meaty little moral quandary that only helps to make this the best season start yet. And I didn’t even mention the symbolism of Carol giving Rick her old watch; a woman’s watch that was a gift she could never give up despite being from her abusive husband. A symbol to her of her own weakness and fear. The Walking Dead 4.04 "Indifference"